I've really been enjoying cleaning out the mouse cage a couple of times a week because it gives me a good excuse to cuddle with the mice and also because after I put them back into their little glass box, they run around like crazy. They're all, "Where's our stink? Where's our stink? You took away our stink! And also our food caches!" I don't know if I've properly close-up introduced them to you. This next set of photos is dedicated to j* who commented on my last mouse post, "Do you... touch them? The mice?" Why, yes, j*, I do. I think Squeaky is the youngest. She's always doing something fun. Scabbers is the prettiest. Her fur is so curly and shiny that she's almost iridescent. Poseidon also has a subtitle: Climber. Whiskers is the mouse most likely to have someone else's stray poop stuck somewhere on her body. My friend asked her husband what he imagined I would name a mouse and he guessed Gerbil. I am apparently getting far too predictable. Or he is my humor doppelgänger. I had a moment of panic the other day when Gerbil hadn't come out of the tiki hut for a long time and I convinced myself that she was in there giving birth. Fortunately, she had not. I've been doing some math and we've had the mice for about 16 days. The gestation period for mice is about 19-21 days. 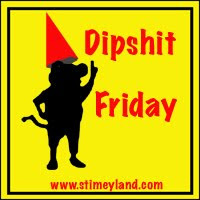 If my math is correct, that means that by next Dipshit Friday I will either be in the clear, baby mouse-wise, or it will truly be Dipshit Friday and I'll be suing the pet store. My other friend (I have two!) came by to let her kids pet the mice today and insisted that I blog about the, and I paraphrase, "Super nerdy sign you put up there." I insist that Quinn made me make it. Also? It really IS Mouse Town. Jack made a sign too. Why he made it out of a cross, I don't know. We're not running a cult here. I had to make some changes to Mouse Town since the last time you visited. They removed the roof from their grass-topped hut, rendering it useless. I purchased them a super indestructo castle to replace it. I also purchased them a bird ladder to help them get to their ceiling wheel. And, you know, for escape attempts. Don't worry, the lid is securely clipped onto Mouse Town. Each time I clean Mouse Town, I try to create fun obstacle courses out of their toilet paper tubes and stuff so they have new stuff to explore and interesting ways to get around their 10-gallon space. Gotta keep those rodent neural pathways firing! I don't know if it's working though. They don't seem to be getting smarter. Squeaky, you're doing it WRONG!!!! I prefer to call them "imaginative." Remember how Sam lost Library Lion and I was going to have to buy a new copy for the library even though we already owned one? This was a multi-day traumatic experience for him, culminating in one day where he started crying and saying he didn't want to go to school because it was library day and he was too stressed to deal with the whole thing. Today I came home around noon to a message on my machine from Sam: "Hi, mom! I found Library Lion. Don't buy a new one." Three guesses where he found it. In his very own personal cubby at school. The denizens of Dipshit Friday welcome you, Sam.